Is your home feeling a bit outdated? Whether you’re planning to sell your home soon or years down the road, it’s important to keep your home up to date each year. Making regular updates will not only increase your property value, but you and your family will benefit by enjoying these home improvement projects as well. Even if you’re planning on staying in your home for a long time, it’s important to know which home improvement projects will help increase the value of your home and potentially offer a good return on investment. Keep reading for six home improvement projects that will help you enjoy your home more and increase your home’s value. 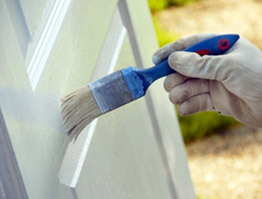 A sloppy paint job can actually reduce the value of your home, so don’t take shortcuts. Prepare the surfaces properly, use multiple coats of paint if necessary and be careful to paint neatly. Everyone’s taste differs, so the more you personalize your color choices, the less your palette might appeal to the average home buyer. If you’re planning to sell your home soon, consider painting with more neutral colors. However, if you won’t be selling your home, personalize and choose the colors that work best for you. 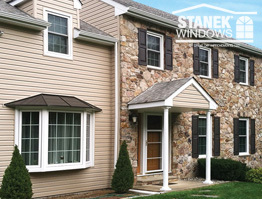 Don’t forget about window and door frames. If you paint the rest of your home but don’t refresh these, it could spoil the overall effect. Plus, depending on the colors you choose, you might need to update them anyway. Kitchens look best when they are fresh, clean and neat. Cracked tiles and sagging or stained counters are unappealing to you, your guests or potential homebuyers. If you’re selling your home, a potential homebuyer doesn’t want to move in and replace the kitchen right away. They want to move in and feel at home immediately. An updated kitchen or bathroom is more important to the value of your home than any other room. You don’t need to go overboard, but replace or refresh anything that’s starting to look tired, dated or worn out. A kitchen should create a great first impression and will also improve your home’s overall appeal and value. Just as nobody wants to buy a home with a moldy or outdated bathroom, you probably don’t want to live with one either. Even if your bathroom isn’t quite that bad, freshening up the finishes and replacing any damaged fittings can make all the difference to the value of your home and potential homebuyers. Storage space in the bathroom also impresses buyers, so if you don’t have a cupboard or other storage space, consider installing it. Just remember to ensure that there is sufficient floor space; no one likes a cramped bathroom. 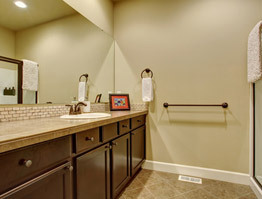 You should also consider installing brand new faucets and towel racks. They don’t cost much and create a lasting impression. If your home is in a luxury niche price range, it might be worthwhile to gut it and start over with a fresh, modern look. Regardless of the changes you decide to make, be sure to keep the color scheme light. Completely replacing your floors can be a huge undertaking and a large investment. Quite often, simply refinishing or cleaning your current floors can do the trick. And again, even if you won’t be selling your home for a while, you can enjoy your updated floors for years and be prepared to sell your home when it’s time. If you have wooden floors, consider sanding and refinishing them for a new, but classic look. Tiles can be re-grouted and even painted using special tile paint. You should do your research before you begin, as it’s vital to use the right materials and not take any shortcuts. If you have to replace flooring, vinyl planks or tiles will give you a good finish for a relatively low cost. A relatively simple project, updating the landscape is a great way to improve your home’s appearance as well as the time you spend outside. A few basic improvements might include pulling weeds, planting a couple flower beds in your front or backyard and pruning trees or bushes. Updating your landscape will increase the overall curb appeal of your home. Work to make your landscaping look tidy and clean. When landscaping, it’s important to eliminate anything that looks messy from the street. Extending your living space with a patio or sunroom is a great addition for any home. These spaces allow you and your family to enjoy the outdoors and can also extend your living space. Deciding between a patio or sunroom depends both on your finances and how you plan to use the space. When making these updates, make sure to use quality materials that match the overall look of your home. If the patio looks like an afterthought, it won’t add value. Research materials and pricing (don’t forget the gutters), get samples when possible, and carefully consider how your new patio or sunroom will look in relation to the rest of the house. While a patio helps you enjoy time outside, adding a sunroom will allow you to enjoy the outdoors more comfortably throughout three or four seasons of the year. 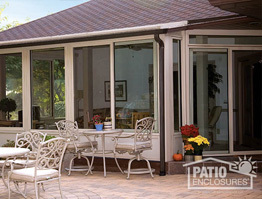 If you work with a company like Patio Enclosures, they will assist you from the beginning to the end of the project, from helping you decide which options work best for you, to building the actual structure. For more tips on how to increase your home’s value, read our previous post on easy ideas for summer home improvement projects. To learn more about adding a new sunroom or enclosing an existing patio or deck, schedule a free, in-home estimate or call 800-230-8301.